I got this recipe from the Clean Eating magazine. My family mainly eats chicken, but it's nice to switch things up a bit! This is a great meal to make a little extra so that you have lunch for the following day! Place steak on a dinner plate, spoon 1 tbsp. vinegar over top and turn several times to coat. Let stand 10 minutes. Meanwhile, prepare sauce: In a small bowl, whish together all sauce ingredients and set aside. Heat oil in a large nonstick skillet on medium-high heat. Tilt skillet to coat bottom lightly. Cook steak for 4 minutes per side or to desired doneness (you can also grill the steak). Place on a cutting board and let stand for 5 minutes before thinly slicing. Warm tortillas according to package directions. 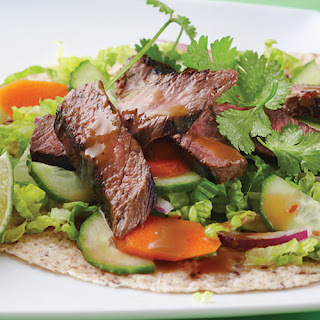 Top each tortilla with equal amounts of lettuce, carrots, onion and cucumber. Divide stead among tortillas and sprinkle with cilantro. Spoon sauce over top, diving evenlin. Wrap to serve as a sandwich or serve open-faced.